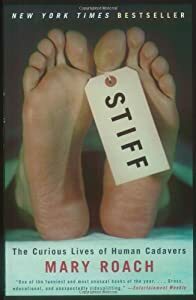 I’ve just finished Stiff: The Curious Lives of Human Cadavers by Mary Roach, and glad I’m back to reading books relatively quickly. This book is definitely not for the queasy. There’s a lot of grotesque detail about decay, autopsy, etc. You definitely don’t want to be eating or about to eat! Unless you’re quite tough 😛 I was eating a bacon avocado sandwich at one point and felt a little off but I guess I was tough enough to keep going! It’s a very, very informative book. It goes from the history of dissection and body snatchers, all the way to cannibalism. Although they’re all sensitive topics, Mary Roach does well to keep the mood light-ish and I found myself laughing a few times at the dark humour. Nicole Rios. 23. London. MSc Gender (Research). Obsessive Yelper. Olympic Whinger. Queer Feminist Extraordinaire. Loneliness is a strangle hold.